Photography will never go out of style because it has the unique ability to literally stop time forever. A child is forever young in a picture and a bird is perpetually in flight. It captures a moment in time for eternity, which is what makes it so special and appealing. Joel Sartore, one of the young masters of photography says, “To me a great picture has three components. It has to have a nice light. It must have good composition, with a background that doesn’t fight with the main subject. And it must capture a moment, which could be an emotion or something that jumps out of the scene. Timing is critical. The best shots are the ones that seem impossible, that simply can’t be done. A classic example is Jim Brandenburg’s shot of a white wolf jumping from one iceberg to another. The photo has a wonderful, soft backlight and good composition, and it captures a perfect moment, with the wolf hanging in midair.” India is a country where centuries coexist and overlap in an endeavour and as such offers tailor-made situations for honing the art of photography. In photography, children are taught about the technicalities related to photography such as the technique of handling the camera with all its components and functions, focusing the object, handling the camera in different types of lights with different kinds of films. Besides this they are made to understand the importance of choosing the right subject, making the best use of available and artificial light, selecting the correct shutter speed, the correct exposure, uses of different filters, choosing the right angle from which to take the photograph. They are taught about the processing of the film and the associated dark room techniques. This includes the knowledge of chemicals required for preparing the solutions for developing the photographs. Children are encouraged to process the film they have exposed, make contact sheets from the negatives and enlarge selected photographs using enlargers. At times, they are given a particular theme and asked to take pictures related to it. They also learn the technique of mounting and displaying their pictures as well as putting up a complete photo exhibition. To provide a barrier-free environment to children for experimenting with the camera and gain confidence in using it. To make children realize that it is their creative vision, which is more important while taking photographs rather than mere application of techniques. To project photography and videography as possible vocational streams to children. To make children understand the importance of team work for the success of a video programme. To enhance the knowledge of children about the people living in different parts of our country, their lifestyles, habits, needs, customs, culture etc. through the twin mediums of photography and videography. To motivate children to explore and capture unusual situations and provide them the experience, thrill, happiness and satisfaction of having achieved this. Apart from using still cameras, children can also try their hand at using video cameras and make their own video programmes. In videography, children are encouraged to think up of a scenario and translate it into a camera script. They are briefed about the technique of writing a video programme and the steps involved in producing it. Shooting as per the requirement of script, editing, sound recording, selection of music and sound effects etc. are explained to them in detail. The most exciting part is when they practically do the entire job themselves. The programmes they produce can be apltly described as ‘of the children, by the children and for the children’. While making video programmes, children are divided into groups and each group produces a different programme. Thus, they learn to work in harmony with each other, apart from learning the various aspects related to video production. 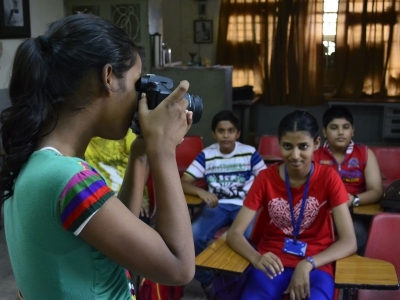 Photography as an activity is available to village children too through the Jawahar Bal Bhavan at Mandi. It is projected to them as a viable vocation, a skill that can help them become self-reliant. Some of the Bal Kendras too have this activity. Under this activity, special photography workshops are also organized and children from Bal Kendras too participate in these workshops. Occasionally, photography workshops for teachers and parents are also organized. As part of this activity children also get the chance to go to different places under the regular ‘Photography Excursion Programme’ wherein they get first hand experience of capturing the sights and translating their perceptions on film. Sometimes special photographic transparency (slide making) workshops are also organized. Children are imparted training in the techniques of slide making and developing a complete audio-visual presentation based on a particular theme. As a visual medium, slides have some inherent advantages. Firstly, they can be enlarged to many times their size and thus every minute detail of the picture gets highlighted. Secondly, since the enlargement is done using a projector in a dark room, the entire attention of the viewer is focused on the picture. When supported by a suitable background score and narration, slides become a very powerful educational tool. Learning how to make slides for projection, writing a script for narration during the audio-visual and composing/selecting the background music essentially promote creative work as a team. This in itself is tremendously educative for the children involved in doing it.